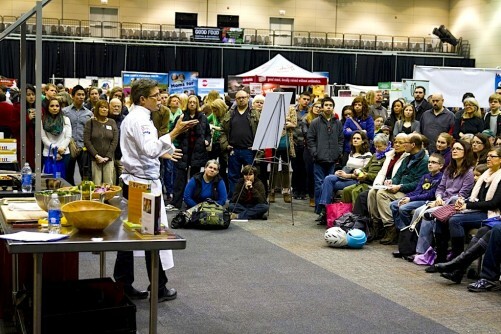 The rapid growth of the Good Food movement was reflected at FamilyFarmed‘s annual Good Food Festival & Conference, which took place last Thursday through Saturday — not only in the big attendance turnout, but in the intensity of interest among the general public in eating better foods and, in many cases, making those better food themselves at home. This was especially in evidence during a workshop on grain milling at home that was conducted by Dave and Megan Miller, the married couple who own Baker Miller, a bakery, restaurant, and milling operation that has had a big impact on the Chicago food scene since they opened it in September. The audience that packed a meeting room at the UIC Forum came armed with smart questions that the Millers fielded with aplomb during the long q-and-a that followed their milling demonstration. 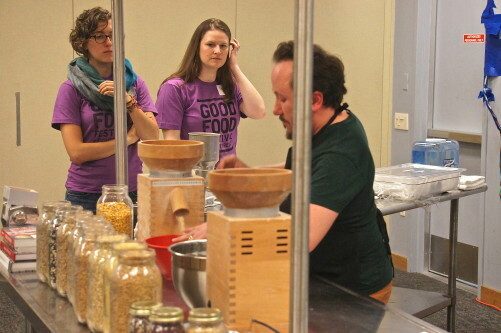 Dave Miller — who with wife Megan owns Chicago’s Baker Miller bakery/restaurant/millhouse — grinds corn during a workshop on home milling at Family Farmed’s Good Food Festival March 21. Following are other photos from the Baker Miller workshop. 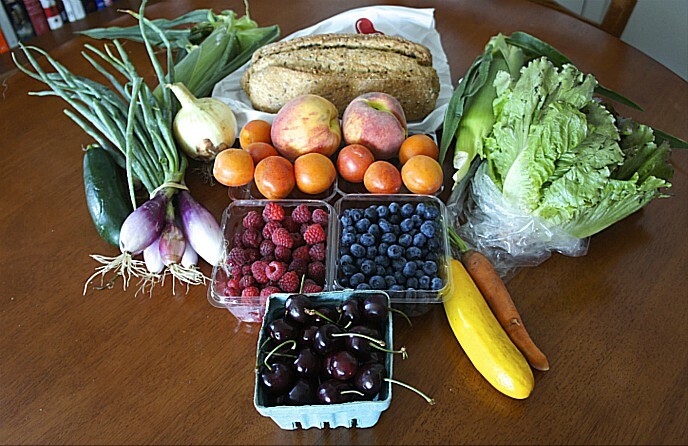 Please visit Good Food on Every Table‘s home page (or click these links) for coverage of other highlights of the Good Food Festival & Conference, including visits by Illinois Gov. Bruce Rauner and U.S. Sen. Richard J. Durbin; a charcuterie workshop by Rob Levitt of The Butcher & Larder (the article includes complimentary pâté recipes! ); a Master Class in artisan bread baking by Greg Wade of Publican Quality Bread and One Off Hospitality; Paul Fehribach of Chicago’s Big Jones restaurant receiving FamilyFarmed’s Good Food Chef of the Year award; and chefs Matthias Merges and Jason Hammel conducting a demo of the innovative Pilot Light program in which they and other peers help Chicago Public Schools integrate food education into students’ curriculum. 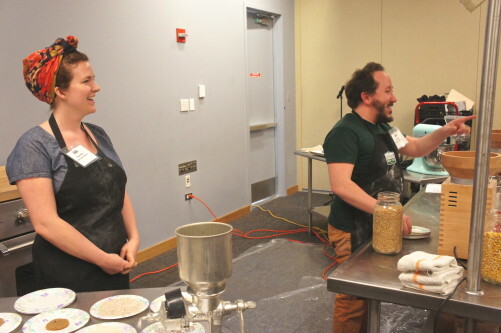 Dave and Megan Miller — who own Chicago’s Baker Miller bakery/restaurant/millhouse — share a light moment with their very engaged audience during a workshop on home milling at Family Farmed’s Good Food Festival March 21. 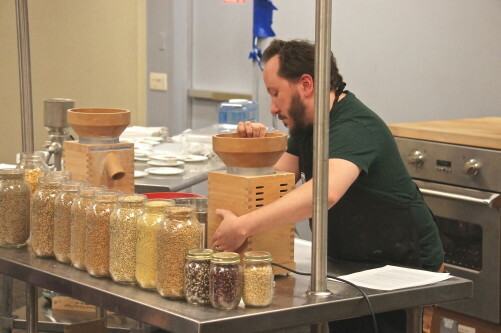 Dave Miller — who with wife Megan owns Chicago’s Baker Miller bakery/restaurant/millhouse — grinds grain during a workshop on home milling at Family Farmed’s Good Food Festival March 21. 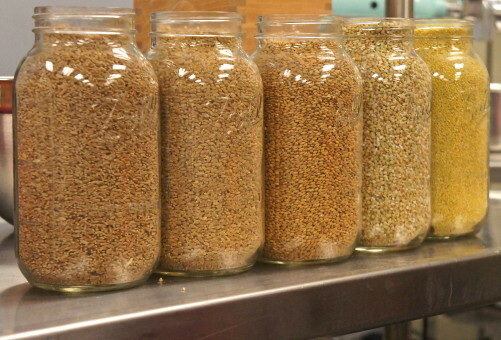 Some of the whole grains sold by Dave and Megan Miller at Chicago’s Baker Miller bakery/restaurant/millhouse, from their workshop on home milling at Family Farmed’s Good Food Festival March 21. This entry was posted in Ancient grains, Bread, Culinary Trends, Food and health, Food Artisans, Food Entrepreneurs, Good Food business development, Good Food Festivals, Good Food marketing, Good Food Success Stories, home cooking, Sustainable food business investment, Sustainable food cooking, Sustainable food retailing and tagged ancient grains, Baker Miller, Baker Miller Chicago, Dave and Megan Miller, Dave Miller, FamilyFarmed, Flour, food artisans, Food Entrepreneurs, Good Food Festival, Good Food Festival & Conference, Good Food movement, grain milling at home, Heirloom grains, Megan Miller, Whole grains. Bookmark the permalink.